Soon you will have noise so bad you will think your wheel bearings are bad. All tires begin seperating even with plenty of tread left. Stay away from Falken tires and save yourself some headaches. I just hit 4k miles and I'm getting tire noises. I though it was my bearings or CV but I just put it on the lift today and everything check out ok. My only conclusion is that its the tires. Good tires; relatively average in price. Good handling. Got them as a replacement for the stock Yokohama AVID TRZ. tread looks good. wear well. NOISE ! NOISE !! NOISE !!! I've had these tire six months. They are becoming very noisy. The dealer cross rotated them to try to quiet the noise. I guess that I am going to have to buy a set of Michelins again. These are aweful. I put my Falken ziex's on my 2000 Mustang V6. I had snow tires on my stock 15 IN. rims. Then I upgraded to the Falkens on 18 IN. rims. They are about 3 inches wider than my stocks. They added superior handling and noise reduction. These tires are an excellent value for the price. Not to mention they look wicked nice. FALKIN Z512 ON MY AURORA ARE A BETTER TIRE ALL AROUND THAN THE $800.00 SET OF MXV4 MICHILLEN'S THAT I REPLACED LAST SUMMER.BOUGHT SAME MAKE FOR MY 2002 MITSUBICHI OZ RALLY,PUTTING 512 Z ON MY 2002 3.5 ALTIMA SATURDAY.IM CONFIDENT !!!!! be extra careful mounting them. any tear in the bead, no matter how insignificant, the tire is ruined. i work at a tire shop in tampa, florida. there is absolutely nothing wrong with the falken 512's. i read in a magazine that they were rated number one in quality for what you pay for. i read some of the bad reviews, and the people are not that smart. the guy with the porsche shouldnt be an idiot driving too fast IN THE RAIN. no tire will regain traction. and the other guy must have put 30-40 thousand miles on it.. not to mention his REAR alignment was off. i had the falken 512's on my camaro for a long time before i got rid of it, and they were perfect in every way! dont be fooled by a few people that think they know about tires, ive been dealing with tires for about 4 years now, and in my professional opinion is; if your looking to save money on a real good tire, go with falkens. if you want to spend a little extra, go with toyo proxes 4, or bf goodrich. stay away from bridgestone, goodyears, and even most michelins. those tires are over-priced and you will be lucky to get 20,000 miles out of them. Price, performance for general driving applications. Not a performance tire. Soft sidewall with a lot of flex and poor treadwear. Well, I have bought the same set of tires (Falken Ziex 512) in the same size (205 50 16) for two different cars... a 2001 Ford Focus ZX3, and a 2002 Toyota Celica GTS. On the Focus, the tires were a great improvement all around over the stock Firestones... better handling in both dry and wet conditions, decent snow performance and a comfortable ride. On the Celica it was different story... definately a step down in performance over the stock Yokohamas... wet weather driving was slightly improved, but on dry pavement the handling was greatly reduced due to the soft tread and very apparent sidewall flex... you had to throw the car into corners and compensate for the flex instead of guiding the car through a turn with a stiffer tire like the Yokohamas... they even felt a bit mushy in straight line driving without providing improved comfort. Treadwear was also non-impressive with 30000 miles on the Focus with unspirited commuting before needing replacement and definate signs of wear, especially on the outer edges with 8000 miles on the Celica. 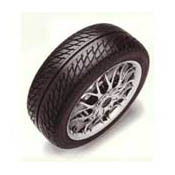 An ok tire depending on it's application, and definately not a performance tire.